Whatever else may or may not be changing in Iran, the situation for filmmakers there remains restrictive. 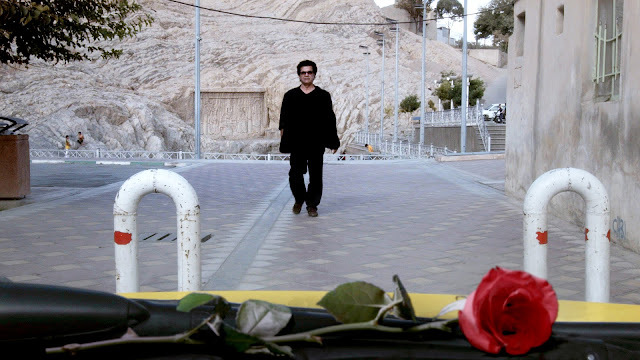 Iranian director Jafar Panahi, placed under house arrest after a run-in with his government's censorship machine, managed to make two extremely low-budget films, This Is Not a Film and the less effective Closed Curtain that were smuggled out of the Islamic Republic. Panahi, who is now apparently enjoying some greater liberty, has made a new feature that takes up many of the same themes as This Is Not a Film, blurring the lines between documentary reality and cinematic artifice. Its conceit, so flimsy as to be absurd, is that Panahi is driving a taxi around Tehran with an anti-theft camera on the dashboard, speaking to a series of passengers who happen to get into his car. The result is ninety minutes of delightful whimsy and meta-satire. In a regime where "sordid realism" is strictly forbidden by the censorship laws, Panahi has extended discussions with a petty criminal (on the subject of capital punishment, no less), a DVD bootlegger (who promises that he can get Panahi any film or television series he wants, even dailies of films still in progress), and a legal consultant (defending women arrested trying to watch sporting events in stadiums, from which women are banned in Iran, with open references to Panahi's masterpiece Offside, the film that appears to have landed the director in all this trouble). This legal consultant, with whom Panahi openly discusses his own harrowing experience with the government interrogators, lays a rose on the dashboard in front of the camera, blowing a kiss of tribute to us, the viewers of "the world of cinema," who will never waver in their support of justice in Iran. While still claiming to be true to the conditions of the judgment against him -- twenty years without making any movies -- Panahi effectively thumbs his nose at any attempt to impose censorship on free expression in the digital age. In one of the stranger passages in the film, two old women get into the director's taxi, carrying a gold fish in a large glass bowl. The goldfish may refer to Panahi's earlier film The White Balloon, which is about a little girl who wants to buy a goldfish, but the women are taking this gold fish to the Spring of Ali. As they explain, somewhat exasperated, they have kept this fish from the spring alive for a year. Now they must return the fish to the spring or they will die. (The spring, in the southern part of the city, is a pre-Islamic site, but these sorts of popular devotions do not die easily, surely a point of contention in the Islamic Republic.) The passenger with the greatest impact is Panahi's precocious niece, whom he picks up at her school. Like the DVD seller, who is pressed into service to record a wounded pedestrian's last will and testament with Panahi's cell phone, the niece seems more directly a filmmaker than her famous uncle, using her digital camera to create a short film for a class project. Parroting her teacher, she dutifully recites the absurd government regulations on cinema to Panahi, all of which are broken in the course of the film, just to be able to show the most basic things. Without being a critique of the government, Jafar Panahi's Taxi reveals the absurdities of living in a society under such rules. This film opens today, at Landmark's E Street Cinema.